NEW HAVEN — A hospital, in order to truly meet its patients’ and employees’ needs, has to do more than provide health care. 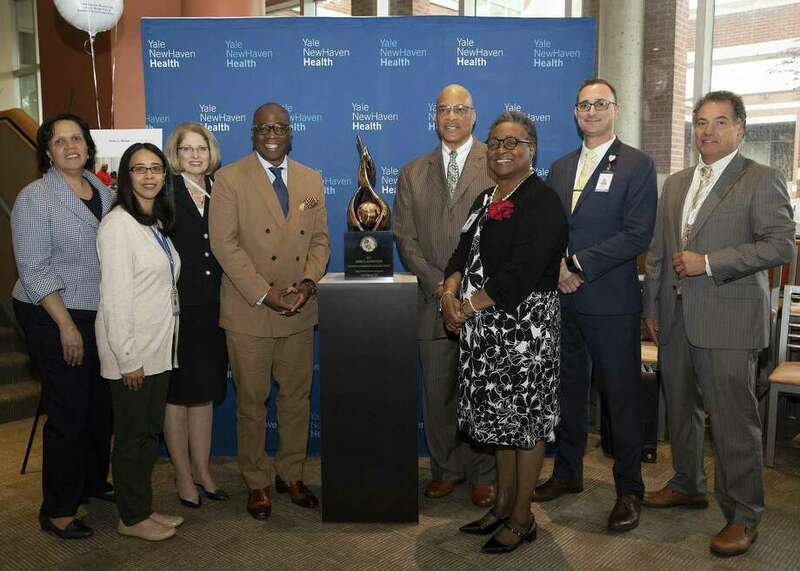 Relationships with agencies that provide shelter, housing and job training are vital, as are those that promote healthful lifestyles, say officials and employees of Yale New Haven Hospital and its partners in Greater New Haven. That is why hospital executives and employees were so proud to receive the Foster G. McGaw Prize for Excellence in Community Service, awarded by the American Hospital Association and the Baxter International Foundation. She said the Foster McGaw prize, awarded since 1986, is “the most prestigious award” given by the American Hospital Association to one organization each year, “and the pride I felt when [hospital President] Rick D’Aquila went out on the stage and got the award was just enormous. The award was presented at the hospital association’s annual meeting in January, but the trophy didn’t arrive until last week. It comes with a $100,000 prize to help support the hospital’s community programs. The community relationships Yale New Haven has built up over the years include Columbus House, the Connecticut Center for Arts and Technology and Gateway Community College. “This past year, we concentrated on the work that we did, especially around our work with Columbus House, home-ownership and housing in general,” said Andrew Orefice, program coordinator for community and government relations. At the Columbus House shelter, 12 third-floor rooms have been designated for a medical respite program that CEO Alison Cunningham said will turn 5 years old in October. “These 12 rooms are for people who have experienced homelessness,” she said. “They have been in inpatient hospitalization. … They need to be discharged to a place where they can continue to receive recuperative care. “When you come out of the hospital, you feel pretty low and need care,” Cunningham said. Patients often need a place to recover from surgery, have their medications managed or their wounds bandaged. The medical respite program offers that place so that a visiting nurse from a home health agency can attend to the patient, who then may be released to stay in the shelter, with a family member or in one of Columbus House’s apartments. “We’ve had people who’ve had cancer, we’ve had people who’ve had some kind of [joint] replacement surgeries” or who are suffering from “wicked wounds,” Cunningham said. “They need the rest and they need the kind of medical attention that they can get from the respite program. “If they’re in and out on the street, chances are if they do not have a home health care nurse trying to see them, that nurse may not be able to find them. … The person is going to end up back in the hospital because they haven’t had a chance to fully recuperate,” she said. It gives discharged patients “an opportunity to think through their next step” to become functioning members of society,” he said. A nurse practitioner, Elizabeth Cusano, is assigned to those patients and readmission rates for those who are homeless have dropped dramatically. “She’ll work within our environment here at Yale New Haven Health at both campuses … then see them at Columbus House as they finish their care,” Churchwell said. Ballou said the hospital has worked with ConnCAT to train young adults, who then are hired by the hospital. “We started a program there in phlebotomy and medical coding and they’re now starting culinary school. We hire a lot of their graduates,” he said. Erik Clemons, CEO of ConnCAT, said, “Before we even put shovel to the ground, Yale New Haven was a thought partner with us, as we wanted to make sure that the training programs we designed were market relevant and [met an] immediate need,” given that the hospital is the second-largest employer in New Haven, after Yale University. Clemons said about 50 ConnCAT graduates have gone through the medical billing and coding, phlebotomy and culinary programs at the training institute, based in Science Park. The hospital employs ConnCAT grads in all three areas. Jason Benjamin of Vernon is a ConnCAT graduate who works both as a phlebotomy technician at the St. Raphael Campus and as a lab assistant in the blood bank department at 20 York St.
Yale New Haven’s partners also include the Workforce Alliance, New Haven Works and Career Resources. Yale New Haven has also contributed to home ownership in the city. Working with Habitat for Humanity of Greater New Haven, the ninth and 10th hospital-sponsored houses are being built on Vernon Street, according to hospital spokesman Mark D’Antonio, and 176 employees have been helped to buy homes through the Home Ownership Made Easier program. Key Bank is a partner in that program. Several programs focus on supporting families, especially those with small children, such as Me & My Baby, Healthy Start, the Pediatric Dental Center, Supplemental Infant Program and school-based health centers. Ballou said the hospital donates infant formula to mothers who need it. Ena Williams, chief nursing officer for the hospital, said another Yale New Haven partner is the Police Athletic League’s monthlong Camp New Haven, held at Wilbur Cross High School. “We’ve developed a program where we actually take two days of the camp and call it Yale New Haven Hospital Day,” Williams said. “Our real goal for this is to really expose the students there to health care and all the different opportunities there are in health care.” Between 150 and 200 hospital employees volunteer, she said. “We set up a mock hospital at the camp so kids can interact” and there are demonstrations such as what can happen in a car crash if a passenger isn’t wearing a seatbelt, she said. Each year, the youths receive a gift such as a bike helmet.